Description — Seven 8° volumes (27 x 19 x 19 cm), hardcovers, slipcases, glossy b&w pictures. Condition – Fine (wear to slipcases, very occasional foxing). Remarques & avis / Review — A remarkable collective panorama of Kyoto in the early 1970s, in more than 1,000 fine pictures in black monochrome and strong contrasts. Vol. 1 - YAMADA Shuji / HAYASHIYA Tatsusaburo. 1000-nen no Kokoro (A 1000-year Heart). 248 p., 153 pictures. Vol. 2 - NAKAGAWA Kuniaki / MORIYA Katsuhisa. Machi no Katachi (The Shape of the City). 242 p., 171 b&w and 3 color pictures. Vol. 3 - INOUE Seiryu / YODA Yoshikata. Haru Miru (Spring: To See). 246 p., 167 b&w and 1 color picture. Vol. 4 - YOKOSUKA Noriaki, HIRASHIMA Kunio, OTANI Katsumi / YOSHIDA Mitsukuni. Natsu Tsukuru (Summer: To Make). 260 p., 172 b&w and 2 color pictures. Vol. 5 - MORI Akira, INOUE Seiryu / AKAI Tatsuro. Aki Asobu (Autumn: To Play). 246 p., 166 b&w and 3 color pictures. Vol. 6 - YOKOSUKA Noriaki, HIRASHIMA Kunio, OTANI Katsumi / TADA Michitaro. Fuyu Sumau (Winter: To Live). 268 p., 175 b&w and 3 color pictures. Vol. 7 - AIDA Yuji, YAGIOKA Hideharu. Ame no Yoake no Monogatari: Kikigaki-shu (The Tale of the Dawn of Rain: A Collection of Transcriptions of Oral Tales). Pict. 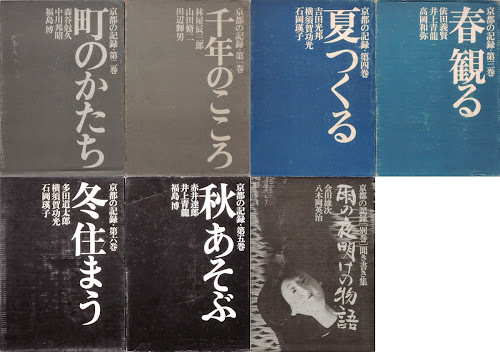 slipcase, 264 p., text only, in Japanese.